The Lakes International Comic Art Festival tales place this weekend in Kendal (13th – 15th October 2017). Along with its free Family Zone, comic creator talks, signings, exhibitions, illustration portfolio reviews, Finnish Village (and sauna!) 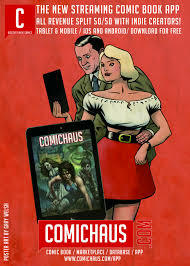 there are a number of new comics and graphic novels getting their launch at the hugely-popular annual event. Among them are Grandville: Force Majeure by Festival Patron Bryan Talbot (published by Jonathan Cape), Graphic Science by Darryl Cunningham (Myriad Editions); and the Festival’s very own tribute to comics legend Will Eisner to mark his centenary, the Spirit Centenary Newspaper. Grandville: Force Majeure launches at the Festival just as news breaks that the rights option for a proposed Grandville TV series have been bought by Euston Films, with Doctor Who and New Tricks writer Julian Simpson adapting the graphic novels. Dozens of comic creators will be selling new independently-created comics, artwork and more, throughout the weekend in the Clock Tower, including Marc Jackson, who’s new comic Here Comes Cat Stevens! was commissioned by LICAF; and Australian comic artist Bruce Mutard, who brings his new work Post Traumatic with him, along with a number of other antipodean creators as part of a Caravan of Comics. Look out, also, for the annual Festival anthology edited by Dan Berry, assembling comic stories created during the Festival’s Cartoon Cafe Challenge sponsored by Wacom over the weekend and printed within 24 hours of creation! “I don’t know how real editors do it, but curating this project has been well worth the wait,” says Sean Phillips, who edited the newspaper. “All the creators involved have more than surpassed my expectations to produce a great tribute to Will Eisner’s The Spirit. “Creators include some of my favourite artists and writers and the hard part was deciding who to ask. Luckily everyone said yes, including my absolute favourite, John M Burns. Sorry to everyone else, but having John draw a page for this is one of the highlights of my career. All the pages are great, but this one was a real thrill! Celebrating Will Eisner’s work, the Festival also ran a Revealing the Spirit of the Lakes competition, the winners to be announced at the weekend. Students across the globe were invited to celebrate the incredible creative comic art legacy of Will Eisner and his iconic vigilante – The Spirit – by imagining a vigilante hero or heroine for the Lake District. Previous DC Superheroes are back on Sky!